Hear 6th grade students explain multiple strategies for finding an equivalent percentage to the fraction, 7/8. The teacher uses effective questioning to elicit responses from students. This is an excerpt from an EXCELLENT website that has numerous lessons for teaching the mathematical standards (content and practice). For the shortened PowerPoint Presentation that shows what it looks like to teach congruence and similarity in the way the CCSS/KCAS intened. To be redirected to the website that includes a video clip of a student working through a problem and for downloadable lesson resources, please click, here. 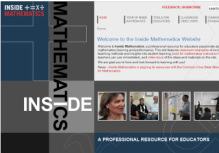 Developed in April 2012, the Common Core Standards Writing Team developed this companion document to explain, in depth, the progression of the high school probability and statistics standards. Click here for the link to more progressions documents. Click here to redirect to Formative Assessment Lessons.